A tussle between Mongolia’s authorities and some 60,000 “ninja miners” for control over the country’s gold industry captures in microcosm the broader battles that Ulaanbaatar is waging to shore up its slumping tugrik currency and central bank reserves. The ninja miners – so named for the green bowls they carry on their backs that resemble the shells of cartoon characters from the 1990s “Teenage Mutant Ninja Turtles” movie – have been wreaking havoc with the nation’s gold production, thus reducing the amount of gold the central bank can buy to bolster its reserves. 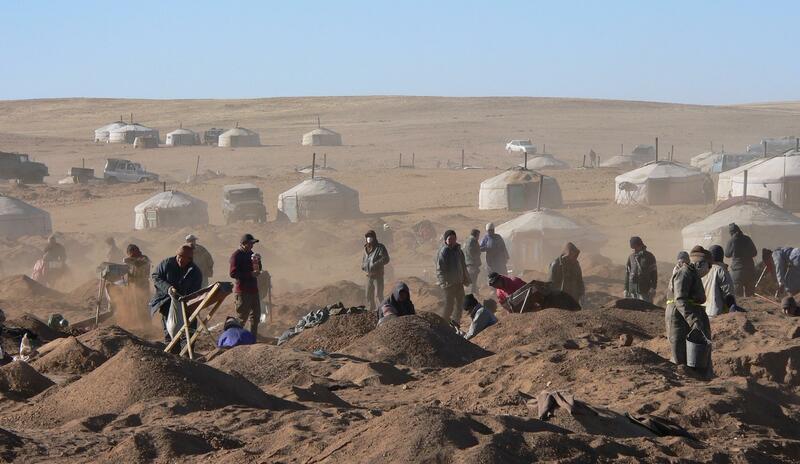 Sifting soil for nuggets in unlicensed pits across vast tracts of steppe and desert, the ninjas may have produced as much as 5 tons of gold last year, according to rough estimates by officials and non-governmental organisations. That figure is not far short of the 9 tons of gold produced officially last year. Both estimates are well short of the 24 tons officially produced in 2005 and 15 tons in 2008. But now the authorities are striking back. In order to bolster the legal production of gold, parliament recently reduced the tax on gold sold to the central bank and accredited commercial banks from 10 per cent to 2.5 per cent, thus boosting the incentive to mining companies and the ninjas to sell more gold to the central bank. “We estimated that revenue in tax will go down by between $40m and $50m, while currency reserves in the bank will increase by between $1.7bn and $2bn,” Davaajav Gankhuyag, the mining minister was quoted in the Mongolian Mining Journal as saying. “When the tax rate drops, the gold trade turnover will increase and it will boost money flow into the economy,” he added. The key consideration of Mongolian authorities is to bolster its foreign currency reserves, which fell 40.1 per cent year on year in January to $2.4bn. The decline in reserves was one reason for the tugrik’s slide to an all-time low against the US dollar in February. Mongolia needs to shore up both ahead of its planned sovereign bond issue this year. “By making it cheaper to sell to Mongolbank (or other authorised banks) the government is trying to make legitimate gold trade happen again,” said Anthony Woolley, senior associate at legal firm Hogan Lovells. If the tax adjustment is successful in driving higher lawful gold production this year, Mongolia may boost production by 20 tons to a total of around 31.4 tons, according to government estimates. Of this, around 20 tons may come from Rio Tinto’s Oyu Tolgoi (OT) mine and another 11.4 tons from smaller producers – including ninjas – who currently smuggle the gold abroad. “We are not talking about future planned productions here, but gold that today is mined and somehow shipped abroad illegally,” an NGO worker dealing with ninja miners said in Ulaanbaatar. The new tax structure was praised by gold producers. Canada’s Centerra Gold, which produced 90,318 troy ounces in its Boroo mine in 2013 and expects another 45,000 troy ounces in 2014, confirmed reports that it sold 100kg of gold to the central bank in January. Mongolia’s stewardship of its resource sector has drawn considerable criticism in recent years. In spite of large untapped mineral resources – including an estimated 221.47 tons of gold and $1.4tn in copper, coal, iron ore, gold and uranium – foreign investors are often reluctant to start operations because of continuous changes in the legal environment. A controversial foreign investment law (Sefil) was passed in May 2012. Originally designed to keep Chinese state-owned companies away from Mongolia’s mineral resources, Sefil hit investors’ confidence, prompting foreign direct investment to plunge by 47 per cent in 2013 and triggering a slump in the tugrik. Sefil was repealed in October 2013, but foreign investments flows have yet to bounce back. Besides, a $5.1bn planned expansion at OT still hangs in the balance as the government locked horns with Rio Tinto over the project’s costs and financing. At the same time, the status of dozens of exploration licences caught up in a local corruption issue are unclear. With foreign investors at bay, the government turned to expansionary fiscal programs and loose monetary policy to sustain economic growth. Preliminary Mongolbank estimates put 2013 GDP growth at 11.7 per cent, down from 12.3 per cent in 2012.
International observers expect the economy to further cool off in coming years, with the International Monetary Fund forecasting a single-digit growth rate (9.6 per cent) in 2014, whereas the World Bank forecasts a 2014 GDP increase of 10.3 per cent. Meanwhile, adding to pressure on the tugrik, the current account deficit – which currently stands at 30 per cent of GDP – is a key concern, the World Bank said in its latest country report.